Nestled in the Ozarks, in the northeast corner of Arkansas, is Bentonville which I’m sure you know is where Sam Walton started Walmart all those many years ago. 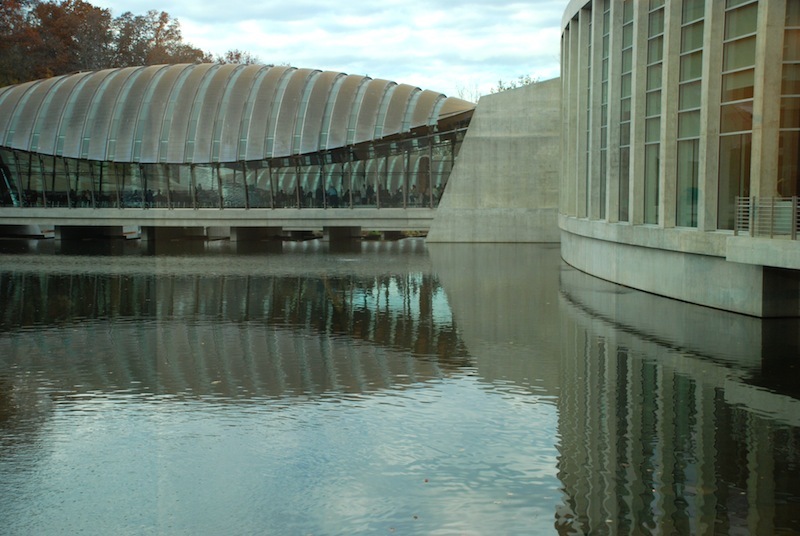 Bentonville’s latest claim to fame is the Crystal Bridges Museum of American Art, founded and funded by Sam Walton’s daughter, Alice with a major endowment by the Walton Family Foundation. 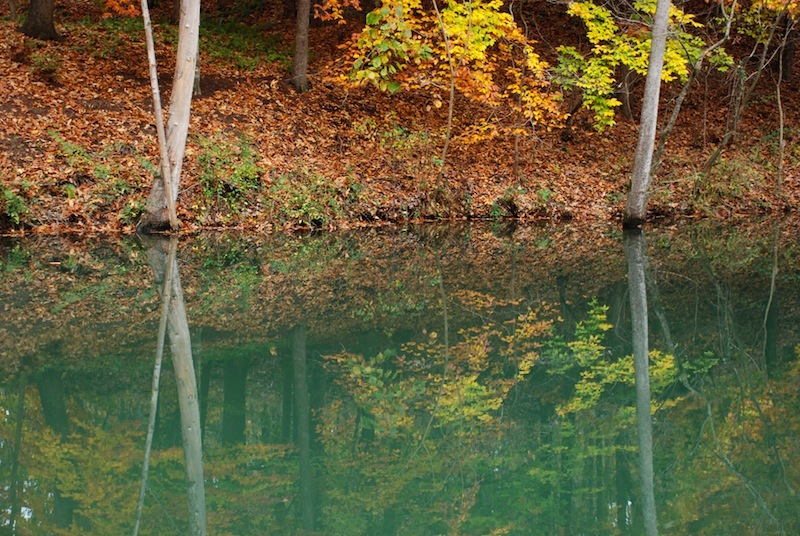 Fall- a good time to take a drive to Arkansas. 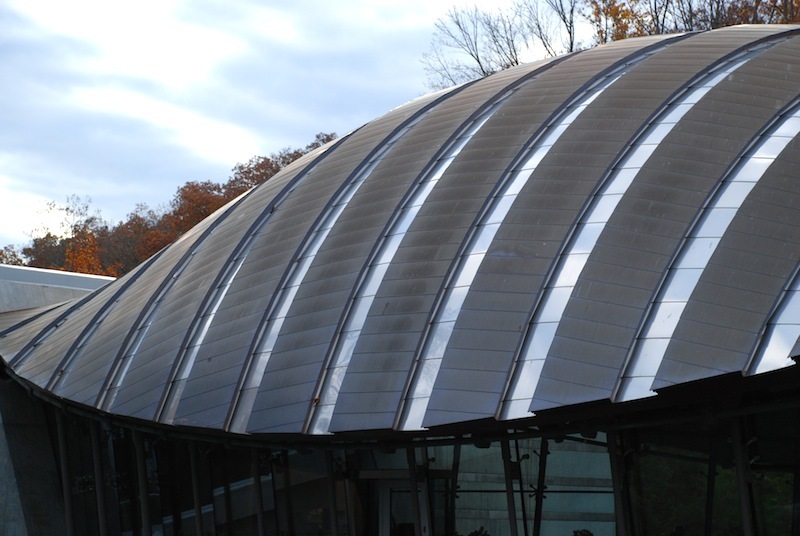 The museum, designed by Moshe Safdie, is set in a natural ravine surrounded by mature native trees, stone walls and creeks. 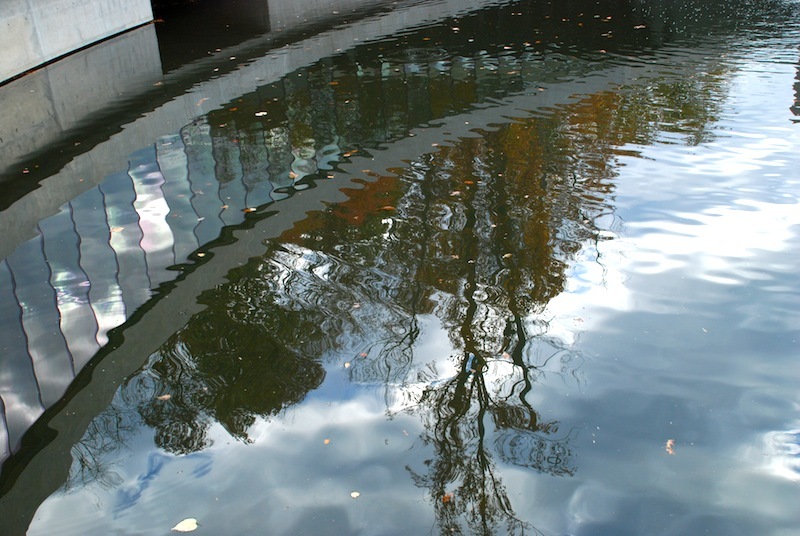 The multi building museum straddles two ponds whose water flow comes from Town Branch Creek and Crystal Spring. Water is an integral part of the design. The materials, concrete, glass, wood and steel complement each other nicely. The natural and man-made are well integrated. The museum’s restaurant, Eleven, has better than average food. 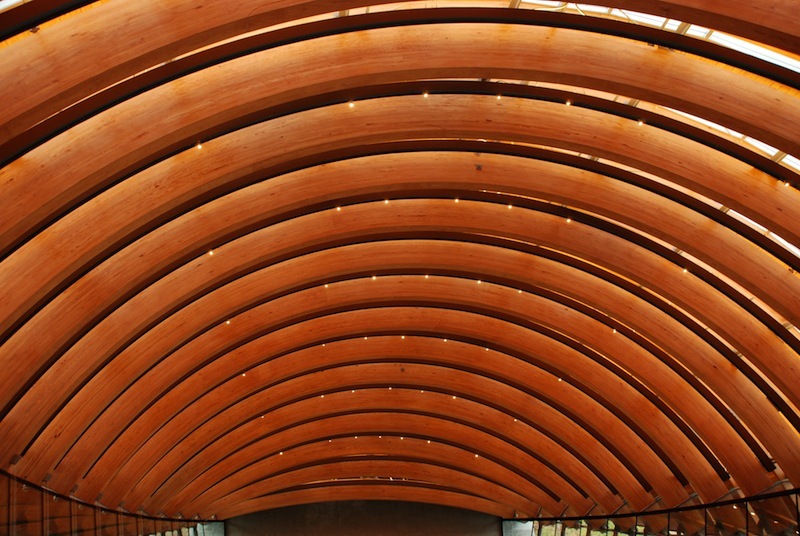 The stunner is a curved wood ceiling that echoes the exterior metal roof. The art collection, from the Colonial era to contemporary art is quite good. There are some well-known American artists, some not so well known (by me). I thought the contemporary art was quite good. Ms. Walton probably needed more mega-millions to buy enough top quality art to fill the museum. 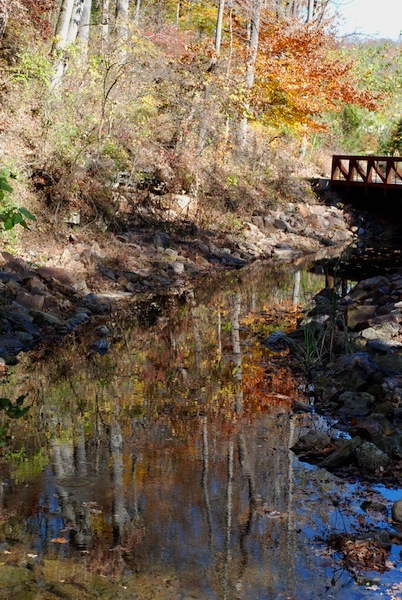 The more than 100 acres surrounding the museum are an added treat with walking paths/trails that loop around and connect with each other for several miles. Large-scale sculpture is placed at intervals along the trails. 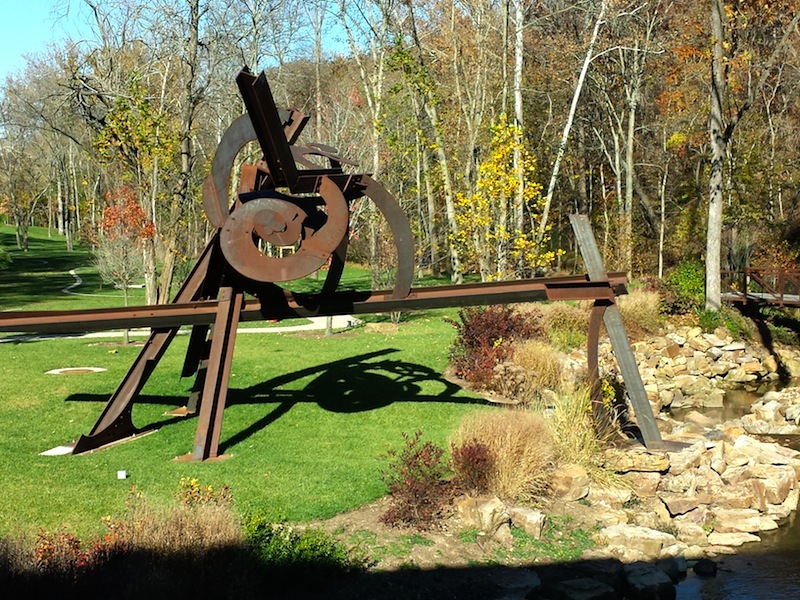 Some like the Mark di Suvero can also be seen from one of the inside galleries, giving one a different perspective. 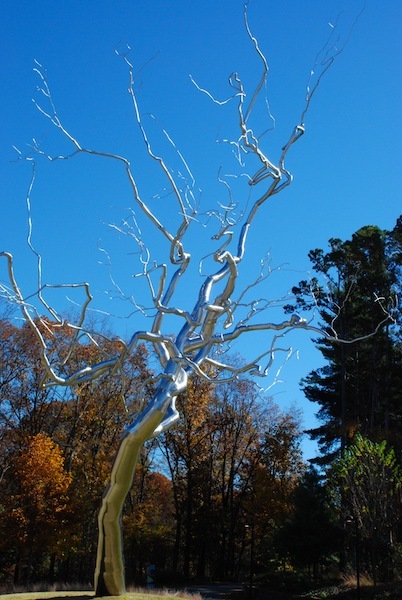 This welded and polished sculpture “Yield” by Roxy Paine is at one of the entrances. There is a similar piece (same series) at the Ft. Worth Modern. Here it is on a bright fall day. 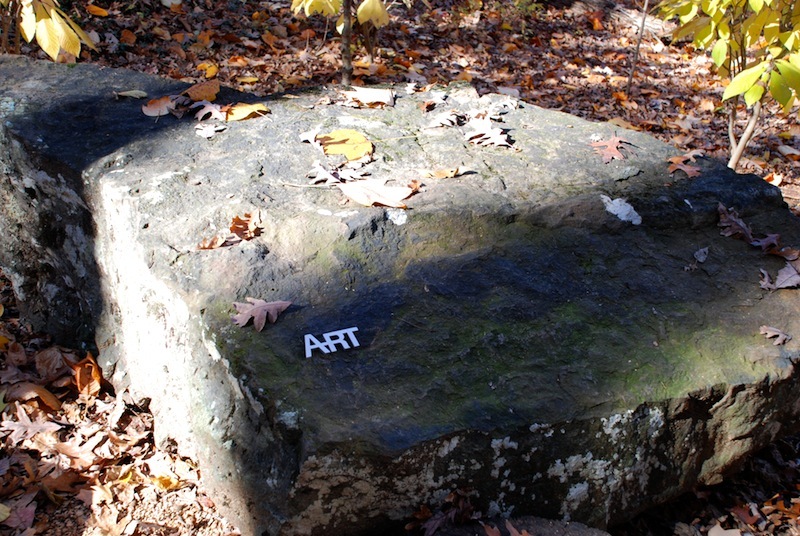 Some art sneaks up on you like Robert Tannen’s “Grains of Sand.” He has placed fifteen boulders of native limestone and sandstone with aluminum numbers and ART on them along the trails. Finding all fifteen was a challenge we were not up for. We did find this one. A short walk from the museum, near the town square, is another recent addition to Bentonville, the 21c. Museum Hotel. As it’s name implies, it is a combination of a contemporary (comfortable and spacious) hotel and museum. 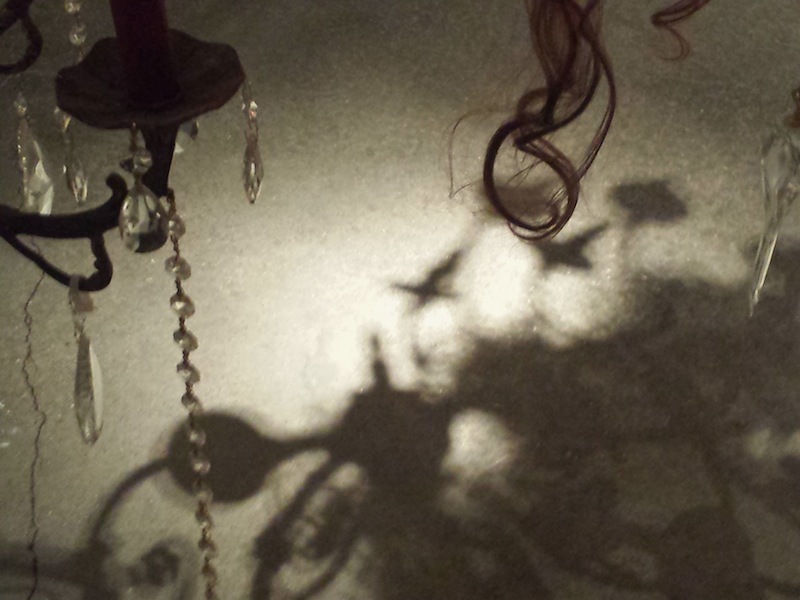 The museum has 21st century art with intriguing site specific and rotating temporary exhibits. The inside/outside areas with a lot of square feet are open to the public 24/7. You do need your room key to access the art on the upper floors. 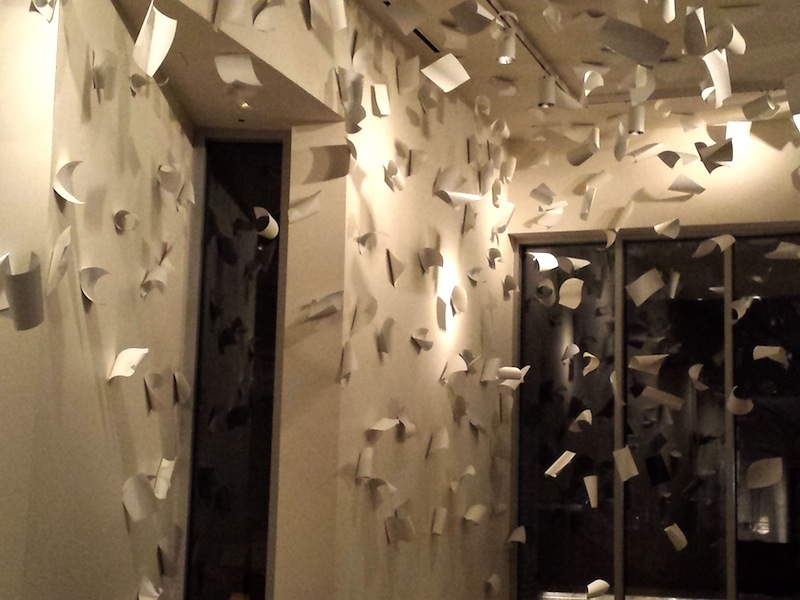 Here are a few pieces from “Outside/In: Site-specific art at 21c. Museum Hotel, Bentonville. 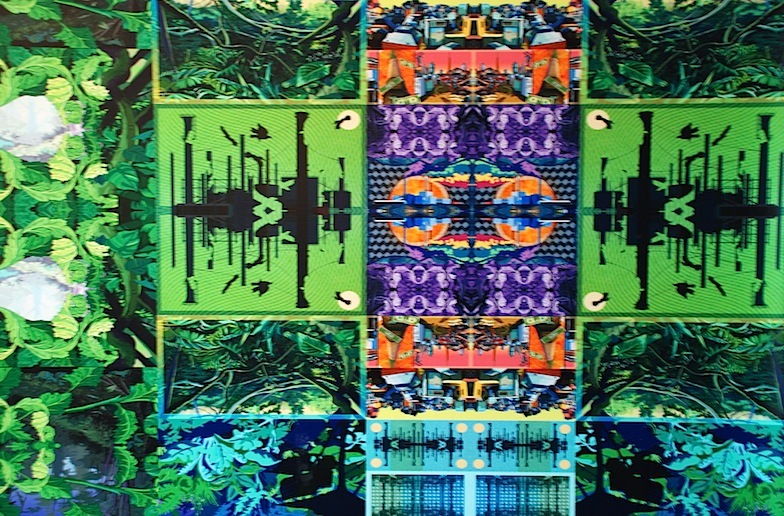 The temporary exhibit during our stay was “Transporting Transformation: Cuba, In and Out.” The artists in this multi media exhibit deal with political, social and economic issues surrounding their identity and experiences. At the hotel’s entrance, on the plaza, sits this 1950’s Plymouth. It’s thought provoking, to say the least. What were those people looking for? Inside is a video lounge (this hotel has everything). 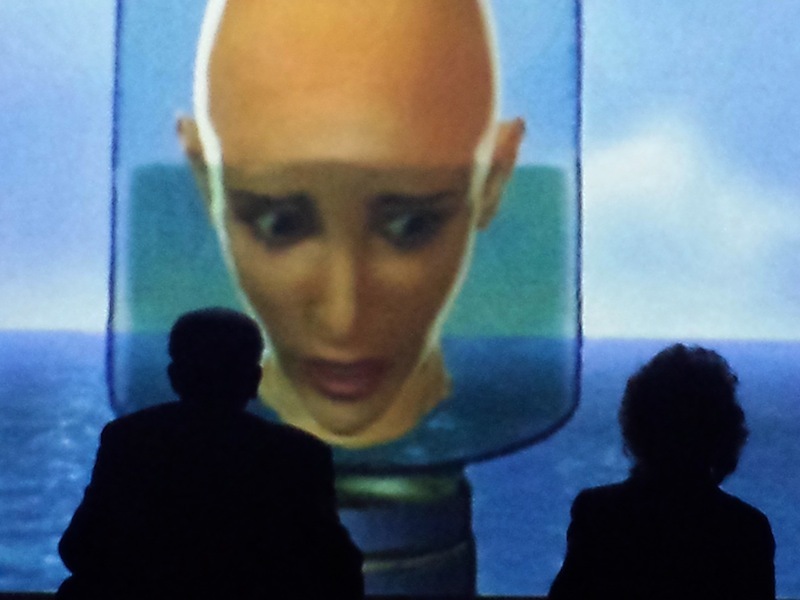 Currently showing is Sandra Ramos’ 3D animations. Carlos Garaicoa’s “El Mapo del Viajero ll”, a wall installation of pushpins and strips of paper with quotations from travel writings, draws you in to read the tiny writing. Or, you can stand back and appreciate the patterns on the wall. 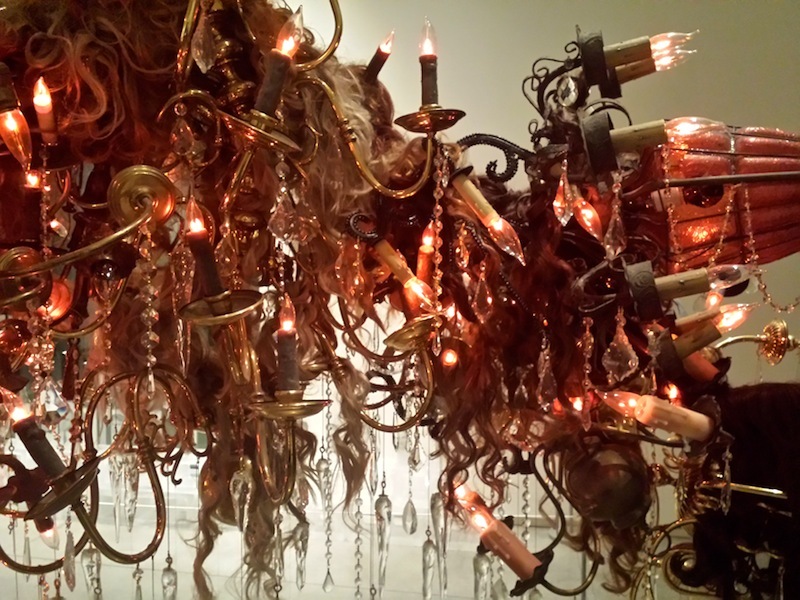 Perhaps the wildest piece, made of found objects (blown glass, crystals and wigs), is “Perfect From Now On” by Amelia Biewald. Lit up at night, the shadows caught my attention. 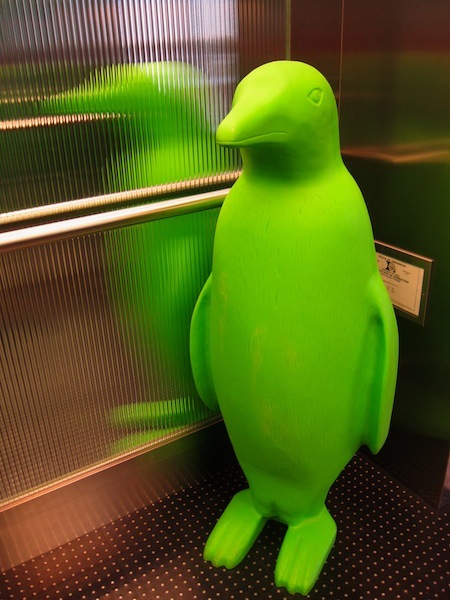 The “Green (color and recycled material) Penguin Flock”, the hotel’s mascots, show up in unexpected places. A whimsical touch, me thinks. We came for the Crystal Bridges Museum. 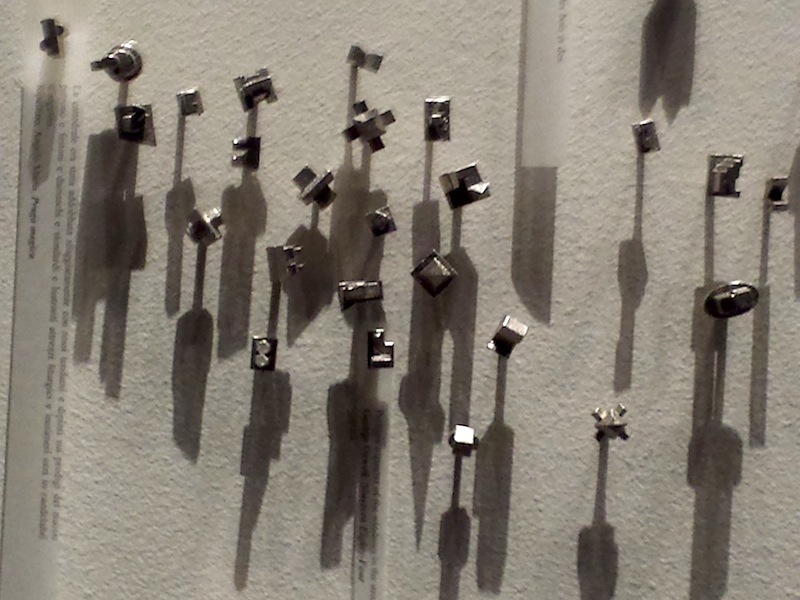 The 21c. Museum Hotel was a delightful surprise. Serendipity!